I like very, very much this model and I can't resist to make a new thread with my three different Delahaye. Behind, in the middle of the photo, is the second type. The one on the right, is the fourth type, with concav hubs, big smooth tyres and black steering wheel. On the left is the sixth type, with concav hubs, grooved tyres and white/cream steering wheel. The three Delahaye with the small bag for 10 replacement elastic strings. Yes Jan. The elastiques are only made for this model and the small bag was available separately. The Delahaye was the first Supertoys made in France and this label was attached to the early issues to celebrate this new range. Note that the Delahaye has right hand drive which is unusual in France but except for their jeep, all Delahayes were right hand drive. Hi Richard, yes the Delahaye was the first to be issued, but I just meant to say that the Delahaye was 'born' as a Dinky Toy and the Willeme was directly introduced as a true Dinky Supertoy (in July 1956, if I'm not mistaken). Just a little odd 'splitting hairs' from me, I know. I have just found an interesting page in a catalogue of 1956. 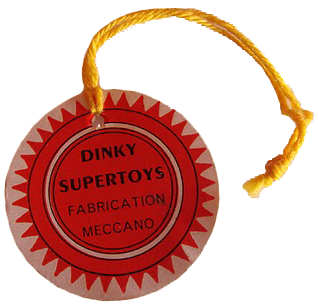 I suppose that as this model was the first DINKY SUPERTOYS, it may have been issued as a DINKY TOYS because the marque SUPERTOYS had not been issued yet. This is why the marque DINKY TOYS has been used for the first year. Note that although the boxes used both marques, the base plates have always been stamped DINKY TOYS. Could you please post the list of the six variations for this model.